Autodesk University has long been the unequaled destination to learn from some of the top presenters in the industry today. While such presentations are still a mainstay of the conference, Autodesk introduced a revolutionary new type of presentation to the roster several years ago. The folks at Autodesk like to call this special subset of classes AU Unplugged. AU Unplugged is celebrated as being an un-conference, or put another way it’s the anthesis of your stereotypical lecture session. Instead of a ninety-minute lecture, AU Unplugged sessions are ninety minutes of thought-provoking conversation. 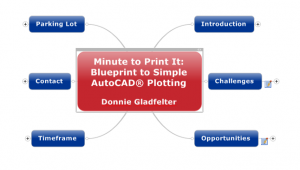 This year I hosted an AU Unplugged session to discuss AutoCAD Plotting. 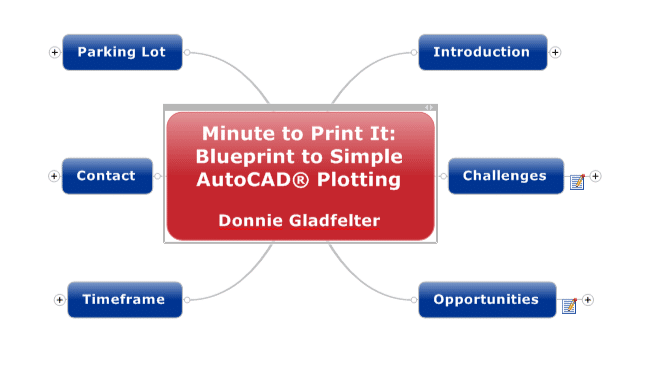 The exact title of my session was “Minute To Plot It: Blueprint to Simple AutoCAD Plotting”. Being a conversation, not a lecture with prewritten a handout, I needed a way to capture the swarm of ideas discussed during my session. To help capture the great ideas stemming from my AU Unplugged session, I chose to use a tool that’s proven to be one of the most versatile applications on my laptop – MindManager. For me its versatility never ceases to amaze me; from managing tasks, BIM documentation, and managing Civil 3D style libraries to name a few applications. Having used MindManager in lieu of PowerPoint for several recent presentations, I began considering it for my AU Unplugged session. My challenge was that it was a conversation I was moderating, not presentation I was delivering. So the question remained – was MindManager up for the challenge? When planing my session, I wanted to structure it in a way that would inspire meaningful conversation. Consequently, I knew I needed two things if I was to come anywhere close to achieving that objective; simple and intuitive organization, and thought-provoking questions. To me the primary purpose of mind mapping is to organize ideas, so I knew the first component was easily addressed, but what about the questions? Mindmap displaying a complete overview of the conversation. I decided to structure my session into three categories, Challenges, Opportunities, and Timeframe. I was pretty confident we wouldn’t have any trouble identifying challenges surrounding plotting, but what about some of the key opportunities to address those challenges? This is where one of my favorite new features within Mindjet’s newly released MindManager 2012 product. MindManager 2012 was, in my opinion, one of the most substantial upgrades since I started using MindManager several years ago. For my AU Unplugged session, the new Brainstorming feature was precisely what I needed to help facilitate my Opportunities discussion. MindManager has included a basic brainstorming feature for some time, but it was really just a tool to gather ideas. 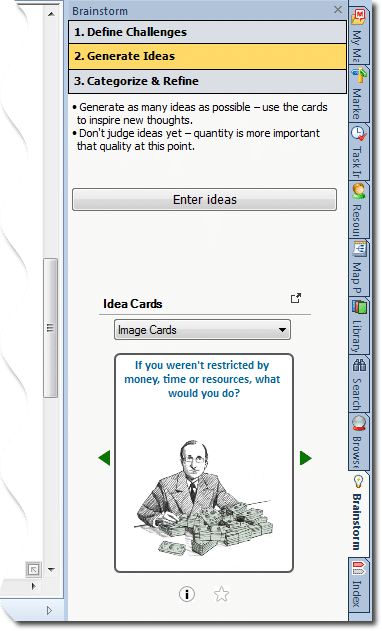 On the contrary, the brainstorming feature within MindManager 2012 helps both inciting ideas, as well as capturing them. 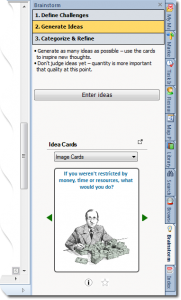 Instead of simply prompting you for ideas, it also presents you with idea or challenge cards. Several very well written cards are included out of the box, but you can also define your own. These cards help inspire the questions I presented during the opportunities discussion of my AU Unplugged session. After using MindManager to help plan and organize my session, it only seemed natural to also use it to facilitate it as well. Since this was a conversation, not presentation, I wasn’t completely sure MindManager was up for the task. In addition to walking through my map, I also needed to add things to it based on the conversational topics that came up. Using MindManager Presentation Walk Through Feature. Despite not being a presentation, I actually found the Walk Through Presentation tool to be the perfect fit. Since attendees had a consistent snapshot of where we were in the conversation, the mind map actually helped keep the conversation on topic. Similarly, since even in the presentation view, I could append the map, it also served as the perfect canvas to capture the wonderful ideas shared by the audience. New features such as the Brainstorming tool only extends the versatility of a platform I already considered among the most versatile on my desktop. 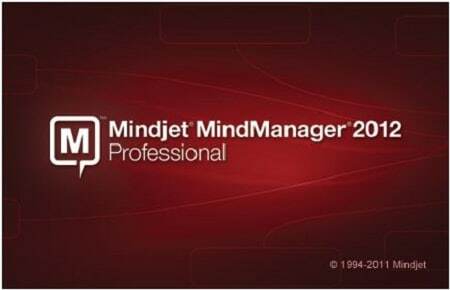 After seeing how well the Brainstorming tool helped me facilitate conversation during my recent AU Unplugged session, I’ve already begun to find plenty of applications for it as well as the other equally impressive enhancements introduced to Mindjet’s MindManager 2012.